Mistrial Bundy Bunkerville Standoff Trial | RANGEfire! 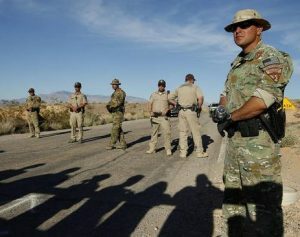 LAS VEGAS, NEVADA: A federal judge declared a mistrial Monday in the first Bunkerville standoff case, which targeted six men accused of conspiring with rancher Cliven Bundy to derail a court-ordered cattle seizure in 2014. The mistrial — an anticlimactic end to a highly anticipated trial — was declared hours after the jury convicted two men of some of the 10 counts in the superseding indictment. In returning the guilty verdicts, which still stand, jurors informed the court they were “hopelessly deadlocked” on the remaining counts and defendants. U.S. District Judge Gloria Navarro sent them back to the deliberation room in a last-ditch effort to encourage them to reach a more complete verdict. “The court does accept the verdicts you have reached,” Judge Navarro said, before sending them back to deliberate. But in the end, the jury was at an impasse — unable to unanimously choose a side in the deeply divided case. The standoff, and then the trial three years later, pitted impassioned libertarian-minded protesters against the federal government. The protesters say they took up arms to defend their constitutional rights against what they viewed as a militant and aggressive federal police force. The federal government asserts there is no constitutional right to vigilante justice. Though prosecutors won convictions against two of the defendants in the first trial, they were dealt a blow when the jury failed to return a verdict for any of the defendants on the two conspiracy charges, which represented the core issue of the trial. “I think it should show the federal government that they have a much weaker case than they thought going into this, because we’ve now had two months of testimony from over 50 prosecution witnesses, and they couldn’t get 12 people to agree,” said attorney Todd Leventhal, who addressed members of the media outside court. Jurors failed to reach a verdict on any of the charges against Leventhal’s client, O. Scott Drexler. Acting U.S. Attorney Steven Myhre, who took over as the top federal prosecutor in Nevada halfway through the trial, declined to comment. Myhre said prosecutors have not decided whether they will retry the six men. The six defendants in the first trial were charged as the gunmen, accused of supplying the firepower in a mass conspiracy orchestrated by Bundy — a stubborn, 71-year-old rancher who for years refused to pay grazing fees but allowed his cows to roam freely on federally managed land. Prosecutors, from the beginning, have described the six gunmen as the “least culpable” of the 17 people they eventually plan to try. “Ultimately I’m happy, although I certainly would have rather had an all-out acquittal,” said attorney Jess Marchese, who represents Eric Parker. Parker was photographed in the prone position, pointing a long gun toward federal officers. He testified at trial and told jurors he did not care about the cows. After declaring the mistrial, Navarro set a new trial date of June 26 — the same day Bundy and others charged as ringleaders of the conspiracy are slated to be tried. Gregory Burleson, a formerly active member of Arizona militia groups who used to be a paid FBI informant, was convicted of assault on a federal officer, threatening a federal officer, interference with interstate commerce by extortion, obstruction of justice, interstate travel in aid of extortion and multiple gun counts. He faces a mandatory minimum sentence of 57 years. During the standoff, Burleson was photographed holding a long gun on a mesa, perched above the dried-up wash where Bureau of Land Management agents were impounding cattle. Todd Engel, an Idaho gun rights activist, was convicted of obstruction of justice and interstate travel in aid of extortion. Engel, who represented himself at trial, now faces up to 20 years in prison. During the standoff, Engel was photographed holding a gun on a highway overpass, overlooking the wash where federal authorities were impounding cattle. Prosecutors played a video of him at a social event the day after the standoff, talking about how he and other protesters followed Bundy’s orders to go get his cows from federal officers. Even though Burleson and Engel were convicted, they still could be retried on the other charges on which the jury was hung. They both are scheduled to be sentenced in July. No shots were fired during the April 12, 2014, standoff, which ended when BLM agents, outnumbered by armed protesters, released roughly 400 cows and went home. The event marked a flashpoint in Bundy’s decadeslong battle against the BLM. Federal prosecutors say that when authorities started rounding up cattle, Bundy responded by recruiting militiamen from across the country to help him block the impoundment operation. Hundreds of protesters descended on Bunkerville. Defense attorneys argued that their clients were innocent because they had no knowledge of a conspiracy to stop the roundup — and no interest in the cattle seizure. 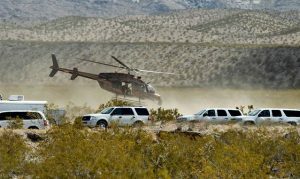 Rather, defense attorneys argued, their clients traveled to Bunkerville after seeing videos that led to grave concerns about federal overreach. 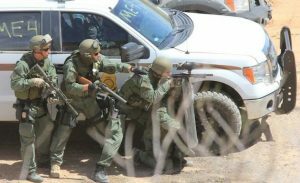 The lawyers pointed to videos of federal officers using stun guns and police dogs on Bundy’s sons in the days leading up to the standoff, and knocking a middle-aged woman to the ground. They showed the jury pictures of a First Amendment area in the middle of the desert to argue that their clients were not assaulting officers, but instead protesting what they viewed as an infringement of constitutional rights. The jury deliberated for nearly six days before returning the partial verdict. The trial opened with jury selection Feb. 6. Review-Journal writer David Ferrara contributed to this report. Contact Jenny Wilson at jenwilson@reviewjournal.com or 702-384-8710. Follow @jennydwilson on Twitter.